Lake Superior is the largest freshwater lake in the world by surface area. 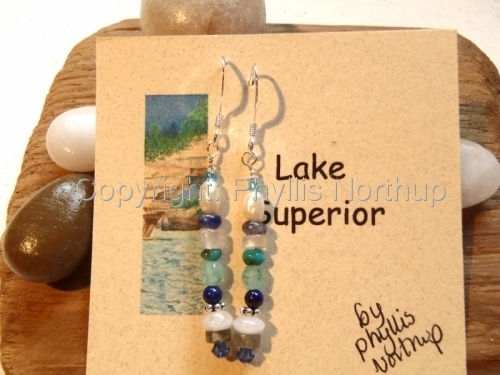 Her magnificent array of colors inspired these earrings; the deep cobalt blue horizon, white waves, light greens over the sand bars and shoals, deep emerald, turquoise and a multitude of variations of them all! Constantly changing with weather, season, light and wind, many of us think it is the most beautiful lake in the world as well!! Made of agates, quartz, turquoise, moonstone, lapis, sodalite, & other gemstones, glass, freshwater pearls, Swarovski crystal, with sterling accents. 1 1/4" drop. Price includes shipping.